Some kitchens just have that “it” factor. 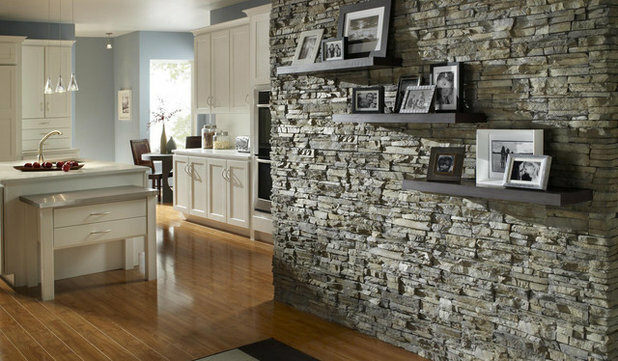 If your cooking space could use a punch of panache, jazz it up with a stone-veneer accent wall. While paint and wallpaper are feature-wall mainstays, a rock-inspired wall adds color, texture and warmth without overwhelming the room. 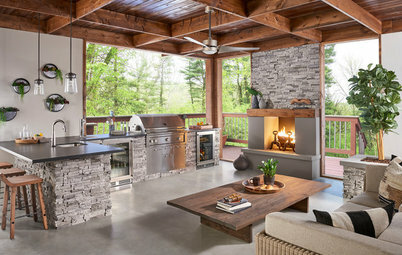 Create a transformative focal point using these ideas from Eldorado Stone, a manufacturer of hand-painted stone veneer. What is stone veneer? Composed of molded concrete and modeled after natural stone, stone veneer can be half the cost and a third of the weight of real rock. There’s no need for footings or anchoring systems to support the weight, making it faster and less expensive to install. Durable and strong, it’s also resistant to mold and mildew. Sitting down to a delicious breakfast and a hot cup of coffee is one of life’s simple pleasures. It’s a time to blink away the sleepiness and revel in a fresh day, or hastily eat a bagel and dash. Whatever your morning routine, where you sit for your sustenance is important. It should be energizing and inspiring, and as pretty as any formal dining room. A brick-veneer accent wall can give your breakfast nook a beautiful boost. 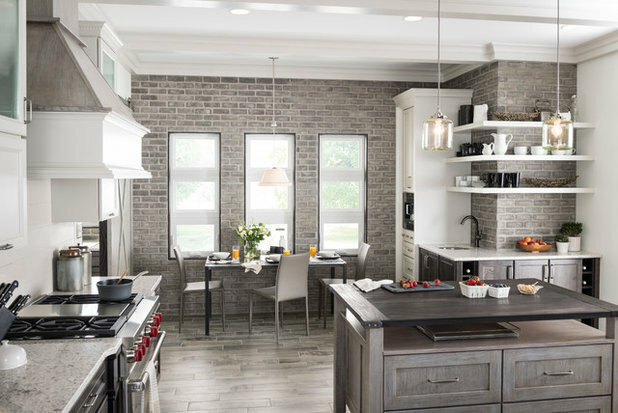 The brick-veneer wall seen here helps create an inviting place to eat breakfast — just add waffles to enhance the effect. Classically shaped, with a slight texture and chiseled edges, this tactile material adds weathered charm to an otherwise polished kitchen. It complements the similarly shaped floorboards, windows and drawers and suits the room’s gray-and-white palette. Extending the brick behind the cabinetry and shelving provides pleasing continuity. Open shelving was a big kitchen trend in 2017 and doesn’t seem to be slowing down. However, removing upper cabinets in favor of a simple shelf or two can leave your kitchen looking a bit bare. To add much-needed depth, use stone veneer behind your open shelves. The large-format limestone-inspired veneer used in this kitchen offers the lightness and simplicity of a white wall with more zest. Anchoring the room, its subtle roughness balances out the high-gloss finishes and lends an unexpected yet chic backdrop to the shelf’s artwork and dishware. And the veneer is easy to clean: Just use mild granulated detergent, warm water and a soft bristle brush, and rinse right away. Pair this accent wall with matte bronze, sculptural shapes, wood floors and greenery for an organic twist on contemporary style. Open floor plans are fantastic for fostering connections and hosting parties. While many homeowners could wax lyrical on this terrific design idea, open-concept spaces can feel cavernous if you’re not careful. Create a more intimate atmosphere using a textural accent wall that spans the length of the room. Visually linking living, dining and kitchen areas creates cozy cohesion in a large open space. 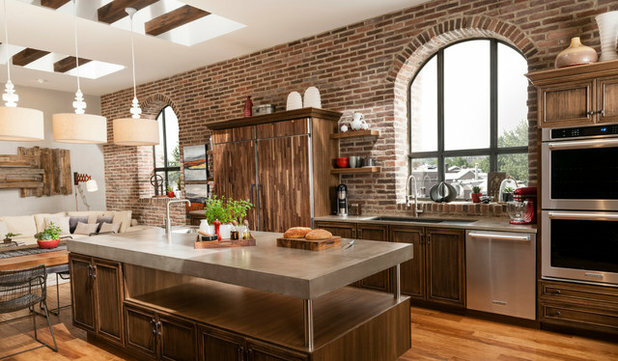 Distressed-brick veneer does the trick in the space seen here. Paired with rich woods, warm hues and layered textiles, it unifies the room and adds character from another era. The irregularly shaped bricks could look as at home in an 18th-century kitchen as they do here, adding rough authenticity to the otherwise transitional space. Hardier than paint or wallpaper, they’ll also stand up to enthusiastic cooking. If you’re nervous about errant marinara sauce (or other staining agents), ask your contractor to seal the veneer. Most homes have a cheerful entryway welcoming owners and guests at the front door. Why not have one welcoming you into the kitchen? 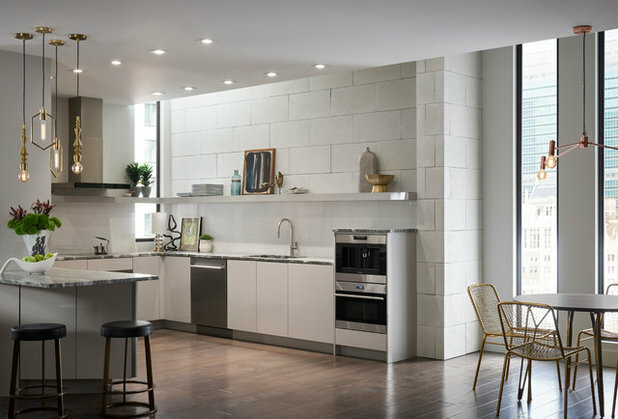 A stone-veneer accent wall next to your cooking space can be a warm greeting as you step into the work area and get down to business. The one seen here injects a shot of rugged texture into the otherwise simple white kitchen. The gray stacked-stone veneer brings nature’s beauty inside and provides an interesting background for tiered shelving and black-and-white family photos. Composed of cut stone-effect pieces attached to a backing, these modules can be installed faster than individual stones, saving you time and money. But what about storage? Fortunately, installing an accent wall isn’t a one-way ticket to a kitchenware cleanout. If you go for a full accent wall, use accessories such as rollouts, racks and Lazy Susans to make your existing cabinetry pick up the slack. Still not convinced? Keep a few upper cabinets on the accent wall to enjoy both storage and style. 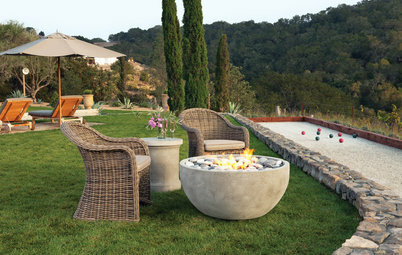 More: To learn more about stone veneer and explore design options, visit Eldorado Stone’s website. I recently used reclaimed drift wood wall planks to accent the sink wall in my kitchen, looks fabulous, and the price point was reasonable. 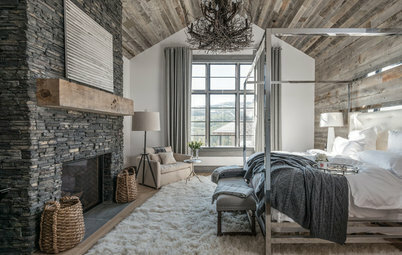 I looked at stone veneer, and it just didn't work well with the style in my space. Am looking into again for outside siding project I am planning. 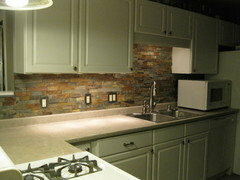 This stone backsplash makes a statement, but is easy to keep.